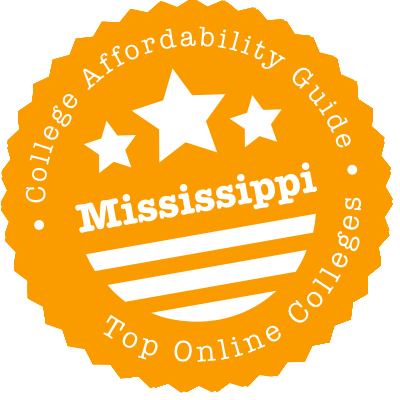 Scroll down to see the top not-for-profit colleges and universities in Mississippi offering online degree programs. Students taking online courses at Mississippi State University do not have to pay out-of-state tuition fees, no matter where they live. However, MSU does charge a distance education fee, which varies by course and number of credit hours taken. The majority of online degrees are at the graduate level, but the university offers four bachelor's degrees online, including elementary education (which allows students to do field work at a school near their home), meteorology, and interdisciplinary studies. The 18 master's degrees available include several degrees in education, including post-baccalaureate programs for students who want to earn a teaching degree. Engineering master's and doctoral degrees are also available in fields including aerospace, electrical and computer engineering, and systems and industrial engineering. MSU also has an online MBA program. The university offers a broad range of services for online students, including an online orientation program. Online students are assigned a distance program coordinator who serves as their point of contact. Online students have access to school services through programs such as online tutoring and technical support. Undergraduates enrolled in online programs are eligible for scholarships. MSU is not authorized to provide distance learning to students living in Minnesota. With nearly 50 online degrees and certificates, Southern Miss is a virtual destination for scores of undergrads and grad students each year. There's something for everyone - an MS in Sport Coaching Education and an MEd in Dyslexia Therapy Education are two of the rarer degrees, but IT, business, library science and nursing programs are also well-represented. The nursing programs were singled out for praise in U.S. News and World Report's 2017 list of the best online graduate nursing programs, where it landed at 57th. The school's Center for Military Veterans, Service Members and Families performs outreach to online students, and the school prides itself on its work with this demographic. Holmes is part of the Mississippi Virtual Community College (MSVCC), so the easiest way for enrollees to find online courses is through the MSVCC search tool. They can limit their search to courses from Holmes - there are several hundred, from Accounting to Social Work - or explore the thousands of offerings from 14 other two-year colleges in the state. As a two year college, expect lots of sections of introductory math, biology, English and psychology courses. Students can take proctored exams at multiple testing sites throughout the state. Belhaven University offers more than two dozen fully online degrees, ranging from associate degrees to master's degrees. Associate degrees are offered in arts, biblical studies, and business. Most of the bachelor's degrees are business related, including accounting, management, and business administration, but students can earn a bachelor's in applied psychology, biblical studies, interdisciplinary studies, health administration, or nursing. Master's options include a Master of Business Administration with four concentrations, a Master of Education with four specializations, and master's degrees in health administration, public administration, or sports administration. Belhaven is a religious university and the Master of Science in Leadership program offers a concentration option in ministry. Online classes follow an eight-week term to provide students with more flexibility, and nine terms per academic year allow students to take more classes and accelerate their degree. Students can view the online class materials at their convenience, and assignments are always due on Saturday. Online students may transfer credits from other universities, and the school has a staff of online admissions counselors and student service representatives who can help with transfer credits. Belhaven Online is accredited by the Commission on Colleges of the Southern Association of Colleges and Schools. Jackson State University is ranked No. 15 of the nation's 74 historically black colleges and universities, according to the 2017 U.S. News & World Report rankings of HBCUs. JSU Online, the university's distance learning arm, offers a range of online degree programs, including bachelor's, master's and education specialist degrees. The majority of programs are at the graduate level, and the majority of those programs are for educators. Career changers can earn a Master of Arts in Teaching, an alternative route to teacher certification in Mississippi that includes a one-year internship. Licensed educators can gain advanced degrees in special education, education administration, reading, and counseling. JSU also has an online MBA. As a member of the Mississippi Virtual Community College (MSVCC), Hinds grants students access to online courses via the MSVCC search tool. Hinds itself runs 500+ class sections across three semesters, but students can expand their search to the 14 other MSVCC participants. (They'll need approval from Hinds to register for one.) Students will find plenty of sections for general ed credits, such as biology, but also courses like Aviation Systems and Art History. Students based in Mississippi can take proctored exams at half a dozen campuses. The University of Mississippi, or Ole Miss, offers fully online degrees in the fields of business, education, nursing, and the health sciences. All online bachelor's degree options are part of the university's 2+U programs, in which students complete two years at a community college and finish their degree through Ole Miss. The 2+U programs are in the field of health. Options for master's degrees include an online MBA program as well as master's in health informatics or health sciences. Nurses can earn a Master of Science in Nursing in six specialties, including family nurse practitioner. Ole Miss Online also offers several master's degrees in education and two education specialist degrees, as well as a Doctor of Health Administration. Online classes follow a traditional semester calendar, although most classes do not require students to be online at a specific time unless the professor schedules a chat section. The university charges out-of-state tuition and other fees for online classes. Online students are eligible for financial aid, and the university offers services such as a dedicated distance learning librarian. Because of various state regulations, Ole Miss does not offer all its online programs to residents of all states. Mississippi Gulf Coast Community College is one of the top 100 producers of associate degrees in the nation, a distinction not shared by any other school in the state or its eastern and western neighbors. Online degrees available through MGCCC's eLearning division contribute to the number of associate degrees conferred. Online students can earn a transfer, or preparatory, associate degree before moving on to a four-year school. The online Associate of Applied Science career degrees are in the business and office cluster, with concentrations such as office systems technology. MGCCC has more than 350 online courses, and online students can also choose from about 3,000 courses offered through the Mississippi Virtual Community College Consortium to find exactly what they need. Northwest Mississippi Community College has fully online programs in a dozen academic pathways, ranging from criminal justice to outdoor recreation management. By following the degree plan for a pathway, students can complete an associate degree that will allow them to transfer all their credits to a four-year school. In addition to traditional full-semester classes, Northwest offers mini-sessions for some classes, allowing student to complete a course with eight weeks of more intensive work. Most online courses require students to take at least one proctored exam, and students who do not live near the school must find an approved proctor. Delta State University, which might be the only school around to have an okra as its mascot, offers more than a dozen graduate-level programs through its online division. The majority of these programs are in education, with offerings at the master's and educational specialist level. Nurses can complete a bachelor's degree or earn a master's or doctoral degree online, and these programs have been honored by several lists of best online programs. There is also an online Master of Commercial Aviation, a program that reflects one of the university's specialties. Online programs are also available for a master's in community development or in social justice and criminology. William Carey University offers two Bachelor of Science degrees online - B.S. Elementary Education K-6 and B.S. Health, Physical Education, Recreation. There are three online master's programs - M.Ed. Elementary Education, M.Ed. Mild and Moderate Disabilities, and M.Ed. Secondary Education. There are also three specialist in education programs - Ed.S. Instructional Leadership, Ed.S. Elementary Education, and an Ed.S. Secondary Education. The university will be adding an online Ph.D. in Higher Education Administration soon. William Carey University uses the Blackboard learning management system to facilitate online class presentations and student-instructor interactions. Mississippi College offers 18 online degree programs and five online certificate programs. Online undergraduate programs are offered in nursing, paralegal studies, homeland security and loss prevention. Online graduate degrees are offered in health services administration, higher education administration, teaching arts, communication, athletic administration, loss prevention, homeland security, health informatics and business administration (three concentrations). Online certificates are offered in homeland security, loss prevention and paralegal studies. Additionally, three online accelerated degree programs are available: a B.S. in Business Administration, a B.S in Communication and an M.S. in Applied Communication. Mississippi College uses the Moodle course management system for the delivery of online courses. The Magnolia State is the land of online opportunity—if you look hard enough! You can take advantage of unique distance opportunities like the MSVCC and 2+U, discounts through the SREB and ACM-EC, and lots of ways to transfer credits. Our quick guide to choosing an online program in Mississippi has the scoop on all these initiatives, plus some advice on how to avoid unaccredited schools. Mississippi Institutions of Higher Learning (IHL) oversees 8 public universities, including State Universities, the Mississippi University for Women, the University of Mississippi, and the University of Southern Mississippi. You can search for online programs offered by these schools on the IHL website. This Distance Learning catalog allows you to sort by type, area, degree level, or university. IHL also runs the website for RiseUp! Mississippi, which has tons of useful advice for prospective students (on-campus or online). The site has career planning tools, college searches, and a step-by-step guide to applying for financial aid. To promote distance learning, Mississippi’s 15 community colleges have banded together to create the Mississippi Virtual Community College (MSVCC). Through the MSVCC, students are allowed to take online courses from a “remote” community college in Mississippi while still receiving support services from their local “host” community college. Along with resources and advice, the website has a complete MSVCC Course Listing and answers to FAQs. MSVCC course tuition costs are the same as traditional courses, and courses are eligible for financial aid. Online bachelor’s degrees (e.g. USM’s Child and Family Studies’ Online Bachelor’s Degree Program) will accept community college transfer credits. Check with the individual program for details. Wondering about out-of-state options? Check out the Southern Regional Education Board (SREB) Electronic Campus. SREB has allied with a number of schools all over the south to create an online program & course catalog. You can search for any degree program or a specific course. Programs that are marked “E” are offered at the Electronic Rate, which means the in-state and out-of-state tuition rates are the same. If you’d prefer an in-state degree, it’s useful to know that all of the Mississippi programs listed in the SREB catalog are offered by public institutions. Participating schools include Delta State University, Mississippi State University, the University of Mississippi, and the University of Southern Mississippi. The SREB also runs the Academic Common Market-Electronic Campus (ACM-EC), a program that allows students to pay in-state tuition rates for certain out-of-state online degrees. However, approved ACM-EC programs must be in one of the 15 participating SREB states. Also, you won’t be eligible for discount tuition rates if a public college or university in Mississippi already has a degree program in your chosen field of study. To apply, you will need to meet the admissions requirements of the college or university that offers the program and be certified as a resident of Mississippi by an ACM coordinator. These Mississippi schools have the honor of appearing on both our “Top Online” and “Most Affordable” lists, which means they met our tough criteria for quality, flexibility, price, and use of financial aid money. (You’ll see a CAG Score next to their profiles in our ranking.) If you’re torn between two options, we also recommend a quick look at the financial and student statistics (e.g. average debt load) on College Scorecard. MSU’s Distance Education has all kinds of info on its online programs and tuition costs. MSU online students pay the in-state tuition rate, no matter their state of residency, and courses are charged by the credit hour, regardless of the number of enrollment hours. Financial aid is available to those who qualify; undergraduates may also be eligible for distance scholarships. What’s more, the MSU Writing Center offers free online tutoring for distance students! Thinking about academic reputation? Among Mississippi schools, MSU has some of the strongest online rankings from U.S. News & World Report. Online MBA and Online Graduate Engineering programs are particularly strong. Ole Miss Online is the place to go for details on online courses, degrees & certificates, as well as tuition costs and financial aid. Additional support is provided by the Center for Student Success and First-Year Experience and Ole Miss’s resources for online learners. When it comes to veterans & military, Ole Miss is known as a military-friendly university and participates in the Yellow Ribbon Program. Are you considering a healthcare career? Check out the 2+U Programs at the University of Mississippi Medical Center (UMMC). These programs allow students who have earned an associate’s degree in a healthcare-related field at a Mississippi community or junior college and passed their appropriate licensure, registration, or certification exams to transfer to an online UMMC bachelor’s program. We should also mention that Ole Miss, like MSU, does pretty well in the business stakes. U.S. News & World Report often ranks it in the Top 25 of Best Online MBA Programs. Always check that your Mississippi college or university is fully accredited by an organization recognized by the U.S. Department of Education. Although national accreditation applies to distance learning institutions (including for-profits), regional accreditation is the gold standard, especially if you’re thinking of transferring credits or applying for federal aid. Avoid any university that makes vague claims about international accreditation! The Southern Association of Colleges and Schools Commission on Colleges (SACSCOC) handles regional accreditation for degree-granting higher education institutions in Mississippi. The homepage allows you to search for regionally accredited institutions by state, and the page on Accreditation Actions notes if a Mississippi school has recently received a Warning or Probation because of quality concerns. Thinking about an online program in another state? The Council for Higher Education Accreditation (CHEA) Database provides a full list of regional & national accreditations for every university in the country. Mississippi experienced a big problem with unaccredited online schools in the 1990s and 2000s. Thankfully, many of these have disappeared, but there are still a few floating around on the web. In addition to those schools, we’ve also profiled some regionally accredited institutions where we found quality concerns. AUH is an unaccredited university with bases in Lebanon, India, and the country of Georgia. It holds no national or regional accreditations that are recognized by the U.S. Department of Education and does not appear in the CHEA Database or College Scorecard. JTS is an unaccredited Bible school that holds no national or regional accreditations recognized by the U.S. Department of Education and does not appear in the CHEA Database or College Scorecard. On its website, it states it has international accreditation from Accrediting Commission International, Inc. (ACI) which is not a recognized accreditation agency. ACI also has a history of controversy. Madison University in Gulfport is an unaccredited school that holds no recognized national or regional accreditations. It does not appear in the CHEA Database or College Scorecard. Madison has been called a “diploma mill”; you can read about its history in this article, Getting Past the Gatekeeper, from Inside Higher Ed. MGCCC is regionally accredited by SACSCOC. However, it was placed on Warning by SACSCOC in June 2016 for concerns relating to accreditation standards. The board reaffirmed their accreditation on December 4, 2016. Strayer University is a for-profit institution based in Washington, D.C. According to the CHEA Database, it is regionally accredited by the Middle States Commission on Higher Education (MSCHE). However, there are no data available on graduation rates or average annual costs on College Scorecard, and the university has a high number of complaints on Consumer Affairs. University of Natural Health holds no national or regional accreditations recognized by the U.S. Department of Education. It does not appear in the CHEA Database or College Scorecard. On its website, it states it has international accreditation from the World-Wide Accrediting Commission of Christian Educational Institutions (WWAC), which is not a recognized accreditation agency. Southern Association of Colleges and Schools Commission on Colleges (SACSCOC): Often referred to as SACS, this is the regional accrediting body for degree-granting higher education institutions in Mississippi. Use the homepage to search for regionally accredited institutions by state. Mississippi Articulation & Transfer Tool (MATT): MATT is designed to help students, parents & administrators transfer credits from one Mississippi institution (e.g. community college, high school) to another (e.g. public university). The website also has useful advice for military and adult learners. MSVCC Course Listing: Search for online courses at Mississippi community colleges that are available through the Mississippi Virtual Community College (MSVCC) program. Online Programs at Mississippi Public Universities: Search for online degrees or certificates offered at any one of Mississippi’s 8 public universities. Southern Regional Education Board (SREB) Electronic Campus: Search for online degree programs or courses being offered by participating Mississippi institutions in the SREB campus. SREB also runs the Academic Common Market-Electronic Campus (ACM-EC).